Mike Jones, R.T. (T), Director of Radiation Therapy at PetCure Oncology at Veterinary Radiosurgery and Imaging Center (VRIC) in Clifton, NJ, was a featured guest on a recent episode of Your Pet Matters by Dr. Michael Tokiwa. Dr.T was joined by Mike Jones, R.T. (T), Director of Radiation Therapy at PetCure Oncology at the Veterinary Radiosurgery and Imaging Center. Dr. T and Jones discusses how PetCure Oncology is using stereotactic radiosurgery (SRS) is treating pets with cancer. Your Pet Matters is a weekly podcast about your pet’s overall health and well-being. From pet wellness to diet, exercise and prevention, Dr. Michael Tokiwa, DVM uses his vast veterinarian experience and knowledge to answer your questions and provide you with helpful medical advice, cutting edge medicinal techniques, natural remedies, alternative therapies and more to keep your dog’s tail wagging and cat purring. 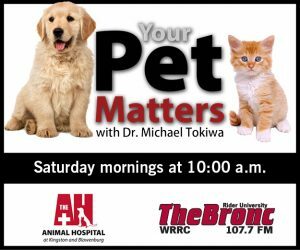 You can listen to Your Pet Matters live every Saturday morning at 10 a.m. on 107.7 The Bronc, online at www.1077TheBronc.com and via our free Android and iPhone apps. Search and download: WRRC1. Also available on iTunes.